In the last few years Atsuko Kawakami has been making a name as a brilliant pianist of great sensitivity. Born in Sapporo, Japan, she started learning the piano at the age of three when she entered the Yamaha Music School and as a child won many prizes, especially in the prestigious PTNA (Piano Teachers National Association) Competitions. She studied at the Tokyo College of Music and also took part in masterclasses at the Salzburg Mozarteum, the Nice Academy and in Germany. She later graduated with honours from the Royal Academy of Music in London, and completed her studies with Martino Tirimo at Trinity Laban Conservatoire of Music and Dance, again graduating with distinction. In chamber music she has performed with a number of well-known violists, cellists, flutists, clarinettists and singers, giving numerous concerts. 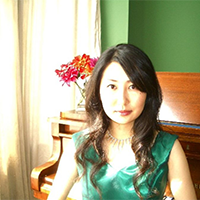 She has also performed extensively as solo pianist in her native Japan, as well as in England, Greece and Germany in a wide variety of repertoire from Scarlatti to Takemitsu. Her recent performances of works like Albéniz’s ‘Iberia’ and Ravel’s ‘La Valse’ have stimulated great audience excitement. Since 2016 she has given a number of concerts with Martino Tirimo, including at the Aegean Arts International Festival, the Larnaka Festival, the Reform Club of London, Open University and London School of Economics. Future engagements include concerts at Parnassos Hall in Athens and Kings Place in London. The ArtsDesk has described her as ‘a first-class musician’.